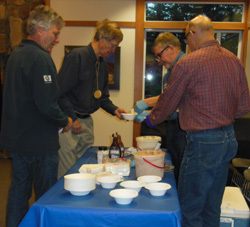 Ice cream, tops and jig & fixture show were the focus of the April meeting. We don't often have enough time for informal discussion amongst us. So this meeting was an opportunity. The show focused on jigs and fixtures but also included some fine turnings. The top spin-off was great fun. Richard winslow won the "donated top" spin-off. Some thoughts on buying a new lathe. I purchased the 20" Woodfast M310 short bed lathe in 2004 from Craft Supplies (CS). Recently Bob Hedges helped replace the four bearings on the spindle shaft, so the lathe was in excellent condition. But I wanted a lathe with at least 20" swing, a moveable head stock, 2 HP, and digital speed readout. My choices were the 20" Powermatic, 25" Robust American Beauty, and 24" Laguna Revo. The Robust American Beauty was the first to be eliminated because of the high cost ($7,784 plus shipping). My two big issues were limited shop space and the weight of the tailstock. I have been able to handle Woodfast's 27 lbs. tailstock, frequently removing and replacing onto the lathe. The Powermatic tailstock weighs 49 lbs. and the Laguna weighs 83 lbs. Both companies offered tailstock swing aways, but would they fit in my limited space? A 36" lathe (distance between centers) plus motor overhang and swing away was too big for my shop. 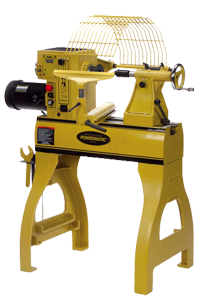 Powermatic offered a 20" short lathe. Therefore, when Powermatic offered 10% discount, I purchased a Powermatic PM2020 from CS. Roger Durst at CS would not sell me the spindle lock, because he thought it would be installed on the lathe. Nor would he sell the remote switch, because he said about half don't work. CS "Frequent Buyer Program" was a bonus, for each $500 spent on the lathe, I received $15 Reward Cash or $105. In addition, the shipping was free and no Sales Tax. Craft Supplies stands behind everything they sell. If you have problems, as I did, Roger and his team were there to help. The Powermatic tailstock base was poorly machined; it was scratching the lathe ways. I sent photos to CS who forwarded them to Powermatic. Powermatic sent a replacement tailstock, but only the casting. When it arrived it was poorer quality than the original. This is a real bummer!!! Then Powermatic called asking for how could they correct the problem, another tailstock casting, some accessory, or some money. I really don't want another tailstock casting and I don't know what kind of accessory I need for the lathe. Now they plan to build a complete tailstock, test it and ship it out! They want me to be a happy, satisfied customer! I have built a remote ON/OFF switch and that makes all the difference, especially when you have been accustomed to having a remote. If I could have fitted a 36" lathe into my shop, I would have purchased the Laguna Revo 24/36 with the swing away. It is the same price as the Powermatic 3520, but has a 3 hp motor, 24" swing, and many other useful features. I can't say enough about all the help I received from WBW members before and after I received my new lathe. The recommendation to buy the Swing Away, help installing the Swing Away and noticing the scratches and relationship of the faulty tailstock. 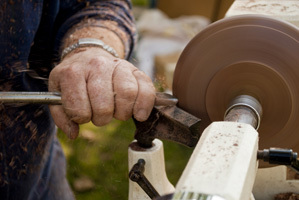 If you are buying a lathe, ask WBW members for their recommendations before you buy. Sadly, we report that Warren Atkins passed away on March 17, 2017. Warren was a founding member of the West Bay Woodturners. 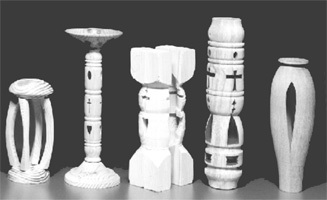 He is fondly remembered for displaying, from time to time at 'show and tell' his newest decorated segmented turnings. They were special pieces. They were sold at high value through his favorite gallery. He said he put the proceeds in a fund for his grandchild's college education. You may read his obituary here. Woodturning videos! What a treasure we have in our club library and on the internet! 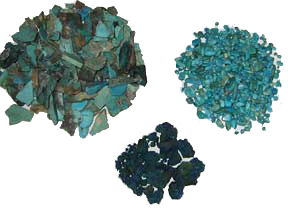 Click here to see the WBW library page. 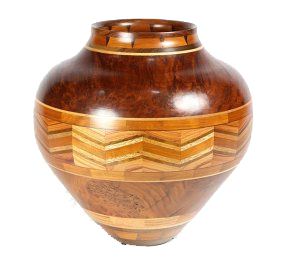 Click here to see a selection of internet woodturning videos. Woodturning video of the month. Click here. 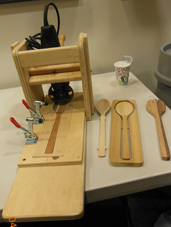 This month's article is compliments of "More Woodturning" magazine. Click here to display the article. In addition, more articles are available here. They are informative and interesting articles, recommended for reading. 2017 WBW board members and committee chairs.